Urethane Sheets – Precision Cast Urethane Sheets! Urethane Sheets ? You’ve come to the right source! Precision Cast Polyurethane Sheeting: We have a unique way to make precision cast polyurethane sheeting using rotational force for the most demanding tolerances. Being able to make precision cast polyurethane sheeting without any secondary process is a great way to create an inexpensive way to make replacement OEM parts with a higher level of quality. Precision cast urethane sheets will be 20’’ by 70’’ long with a tolerance of +/-.010 on any sheet thickness up to ½’’. Urethane Sheet Stock: Urethane sheet stock is some of the high-performance cast urethane products that we manufacture here are Plan Tech. Urethane sheet stock is an ideal replacement for high demand applications were normal rubber and similar materials would fail. We not only have the ability to cast nominal size urethane sheet stock but every dimension in between with excellent lead times. Precision Urethane Sheets: Precision sheets are cast at Plan Tech using rotational force for the most demanding tolerances. 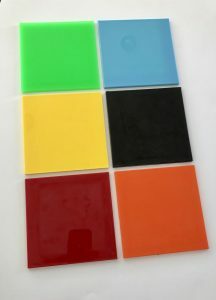 Precision urethane sheets are ideal for high demand applications were normal rubber and similar materials would fail. Being able to cast precision urethane sheets without any secondary process is a great way to create an inexpensive replacement for OEM parts with a higher level of quality. Precision Cast Urethane Sheets: Precision cast sheets will be 20’’ by 70’’ long with a tolerance of +/-.010 on any sheet thickness up to ½’’. We also have the ability to water jet the finished precision cast urethane sheets that will often time’s one sheet will yield 1000’s of parts creating an inexpensive way to make replacement OEM parts. 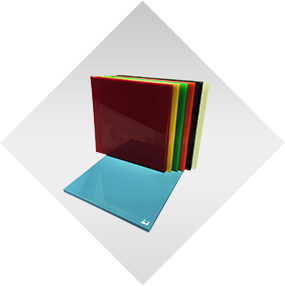 Polyurethane Sheet Stock: Polyurethane sheet stock is available in any hardness or color. At Plan Tech we can cast polyurethane sheets up to 4′ by 4′. Tight tolerance polyurethane sheet stock is also one of our manufacturing specialties. Polyurethane sheet stock is cast from high-quality material and is custom made to any specification required for the application. Urethane has a great ability to absorb an impact and require to its original shape even after years of abuse in almost any environment. High-Performance Urethane Sheets: High-performance urethane sheets are designed for high abuse wear items in applications requiring a high endurance material for some of the most demanding applications. Urethane is a great choice when searching for a high-performance material at low cost with rapid turn around. Abrasion-Resistant Urethane Sheets: Our abrasion-resistant urethane sheets are also capable of maintaining their impressive performance ability even in environments with harsh conditions, and we have them available in a variety of designs. So, regardless of what the requirements of your application are, we assure that we have abrasion resistant urethane sheet with the exact specification you require. Antistatic Urethane Sheets: The physical properties of our antistatic polyurethane sheets is superior to those of most other brands in the industry. Little wonder they are a well-loved favorite for most of our customers who have repeatedly commented on the remarkable ability of our antistatic urethane sheets to resist wear, abrasion, corrosion as well as chemicals. Urethane Sheeting: The urethane sheeting parts that we manufacture are even capable of withstanding unfavorable environments and also have the outstanding capacity to maintain their optimal performance ability after years of continuous usage. For over 30 years we have manufactured high-quality urethane parts such as our urethane sheeting which makes Plan Tech a go-to company where the needs of all urethane parts can be met. Urethane Cast Sheets: Our urethane cast sheets are famous for their impressive ability to resist wear, corrosion, and abrasion. They are also capable of withstanding harsh environment and maintain their optimal performance ability even after many years of being regularly used. Our technical team has the technical know-how to produce urethane cast sheets in different hardness. So, regardless of the specification of urethane cast sheets you need for your application, you can count on expertise to meet your demand with an exceptional level of accuracy. 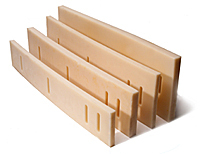 Polyurethane Flat Sheet Stock: At Plan Tech we manufacture and stock the largest selection of polyurethane flat sheet stock. Our in-house machine shop is equipped with world-class facilities, furnished with state of the art equipment that helps us develop multi hardness or dual durometer polyurethane flat sheet stock which can be cast in custom colors, sizes, and durometers. Thin Urethane Sheets: Thin urethane sheets are one of our numerous signature products. Like all of our other urethane parts or products, we utilize the very best urethane materials from globally renowned producers in manufacturing our thin urethane sheets. We design and formulate mass quantities of thin urethane sheets for your specific application. Urethane Rubber Sheets: Urethane rubber sheets are popular for a wide range of industrial applications including scrapers, linings, gaskets and machined components. Plan Tech standard cast urethane rubber sheets meet the highest industry specifications for both durometer and thickness, making them perfect for severe applications. Clear Polyurethane Sheets: At Plan Tech, our clear polyurethane sheets can be custom made in many shapes, sizes and levels of hardness. With over 30 years of experience, you are sure to get the very best clear polyurethane sheets on the market. Anti-Static Polyurethane Sheets: Plan Tech provides anti-static polyurethane sheets that outperform competitive products, in providing long-term reliability of antistatic performance and physical product protection. Our anti-static sheets provide controlled, dissipation of electro-static charges emitted from other neighboring materials during handling, assembly, and shipment of the product. Polyurethane Sheets: The polyurethane sheets come in various forms such as standard urethane sheet, cast urethane sheet, water clear urethane, and precision urethane sheet, which are all manufactured at Plan Tech. They are widely chosen in the manufacturing industry as a result of variations in mechanical and physical properties. Urethane has a unique ability to absorb an impact and return to its original shape even after years of repeated abuse while resisting most chemicals exposed to the parts. Polyurethane sheets are an ideal replacement for high demand applications were normal rubber and similar materials would fail. Urethane is a high-performance material suitable for just about every demanding application where traditional rubber or plastic parts were once installed. Plan Tech not only has the ability to cast nominal size urethane sheets but every dimension in between with excellent lead times that frequently ship in less than a week! 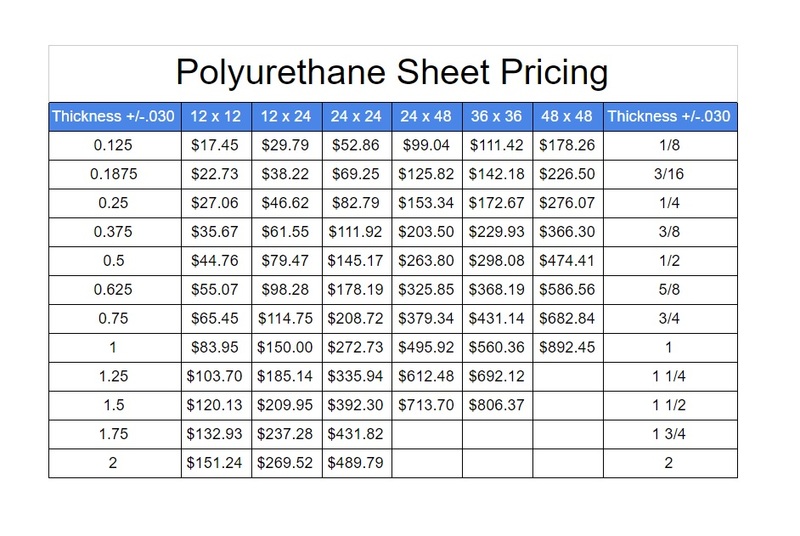 A tolerance of +/-.030 on any urethane sheet up to 4’ x 4’ is standard for us at Plan Tech. We also have the ability to water jet the finished urethane sheets if a tight tolerance is needed for the application. Thicknesses from 1/16″ to 6″ Widths to 48″ and Lengths to 60″. All colors, All duros with a variety of polyurethane additives can be added to enhance wear properties, add lubricity, UV stabilized, flame retardant, or to reduce static build up. A metal detectable additive can also be added for FDA requirements. We also cast FDA approved urethane sheets. Machining cast urethane sheets and molded polyurethane parts requires specialized equipment and training. At Plan Tech we make all of our own molds in-house for speed, accuracy and precision – we control the entire process from design to manufacturing. Urethane sheets are outstandingly able to withstand more loads than rubber because they are harder than rubber and yet more flexible than plastics. Their flexibility is accountable for their strength and remarkable ability to resist impact. Urethane sheets are the perfect choice for applications against severe wear regardless of low temperature. For some decades now, they have been the most used materials for environments that are highly abrasive owing to their super ability to resist abrasion. No other form of elastomers, metals, and plastics has a better abrasion resistance than polyurethanes. Their abrasion resistance ability is rated to be 10 times better than what other materials can provide. Like their abrasion resistance ability, the properties of polyurethane sheet stock are highly capable of resisting oil and chemicals. This enables them to maintain stability (with minimal swelling) in water or oil etc. If you are looking for elastomer materials to use in subsea, then polyurethanes should be your ideal choice. Resilience is generally a product of hardness. Urethane sheets are the perfect choice for elastomer applications that can absorb shock. They have a high vibration frequency or outstanding ability for quick recovery. Their remarkable resilience ensures polyurethanes are very tough materials. Plan Tech also has an outstanding team of dedicated employees with exceptional talents designing and manufacturing tight tolerance urethane sheets. We also are very proud of the “company we keep.” Our customers include many Fortune 500 companies, most of whom have been customers for 20+ years. Their drive to become industry leaders has helped us do the same. Whether you are a start-up company or global leader, we can add value to your tight tolerance urethane sheets and cast urethane components with our strong engineering support, polyurethane application expertise and constant focus on meeting all delivery requirements. Our rapid prototyping capabilities have also received particularly positive feedback – we frequently go from “Print to Part” in 10-15 business days! Everything we manufacture is MADE IN THE USA! How To Cast Urethane Sheets! Please Contact us for further details regarding custom cast urethane sheets!